In the late eighties or early nineties there were advertisements on the Egyptian TV to raise people's awareness about AIDS. But the problem with those TV ads is that they tended to scare people instead of really educating them. They were full of bats, blood, people scaring, others taking drugs via injection and prostitutes who resemble devils. It was scary to the extent that even after reading more about the disease [Ar], and knowing it's only transmitted via blood, you still feel worried to shake hands with those who have it. The other effect of the advertisement is that it makes you believe the disease is only transmitted via prohibited sexual affairs and drug-taking, which is not true. And now, about 20 years later, there is that film called Asmaa which tries to break all those misconceptions. The film is directed by Amr Salama, and it's his second film as a director. It's about a woman called Asmaa who has AIDS, and is afraid to reveal her illness to the society because of the misconceptions they have, and even doctors refused to do her another operation when they knew she has AIDS. The plot of the film is very good, and the best part of it is when she struggles not to tell the society how she got infected, even though it was transmitted to her from her husband, yet she wants to break those social misconceptions about how it gets transmitted. I am not a film critic, but I had mixed feelings about the work of the director and the cinematographer whom I don't know his name. 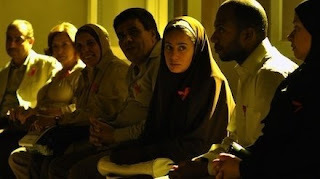 On one hand, the lighting in some scenes was genius, for example, the intention of hiding the faces of those in the group therapy with Asmaa and letting the light hit them from the back came in resonance with their ongoing struggle with the society to hide their illness or identity if possible. The colours used were a bit cold which was also very suitable for the films atmosphere. But on the other hand, some scenes were too video-clippish for my taste, I mean, there was excessive use of shallow depth of field, blurring some areas and the scenes sometimes looked as if they are shot by a Len Baby. Some other times they where a bit over exposed. All those effects are in my opinion more suitable to a video clip than a film, or at least not to be used that much in the film. But you know what, as I said, I am not a film critic, and I can't even tell who is normally responsible for the exposure and composition in a film, is it the director or the cinematographer, and may be someone like myself criticized Gordon Willis' lighting in The Godfather decades ago, then realized later on that he is among the ten most influential cinematographers in history. So, I don't know, but the scenes weren't comfortable to my eyes at least. One final note regarding the actors, especially Hend Sabry the lead actress in the film, she is fine, but if it was some other actress the film would have been much better. Same for Hany Adel, who better sticks to music where he is more talented than in acting. I also watched it in Galaxy Cinema last Wednesday and was expecting the cinema to be more full that that, which is sad, because it's rare to see good Egyptian films like this one and you better watch it yourself and tell us your review and comments on my review here. There are lots of misconceptions surrounding HIV and AIDS. Here in Peru, more than once you see parents and grandparents fighting against the educational system to get their HIV infected grandchildren admitted at school. I want to share my personal movie theater experience because its different than yours. I watched the movie at city stars cinema on Thursday night. I had no high expectations form the audience. Surprisingly, the theater was fully packed. A lot of gasps heard in the dramatic peaks. applause in the end. many were tearing up!